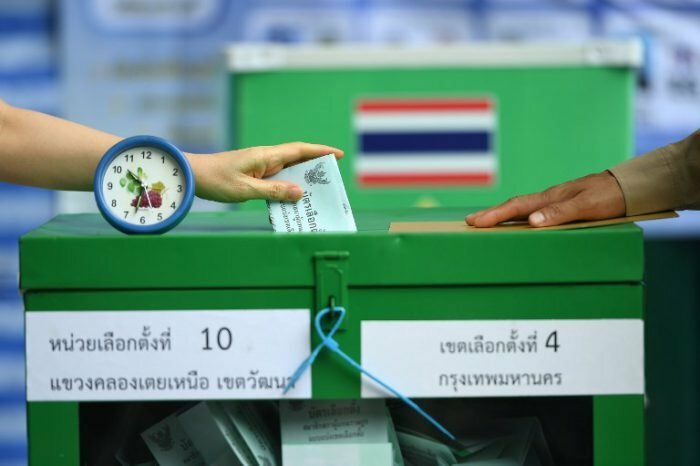 BANGKOK, 26 March 2019, (NNT) - International media outlets have reported on Thailand’s general election. Most of these media outlets have emphasized the fact that this is the first election since the 2014 coup. BBC reported that the 2019 election had 51.2 million eligible voters with 15% of that figure being young voters aged between 18-25. It said most of the voters were looking forward to casting their vote, arriving at polling stations early in the morning. Voters also said they wanted to see changes in the Thai political landscape, adding that they welcome new faces to the political scene. CNN highlighted the fact that the Future Forward Party has drawn support from young voters with its policies revolving around promoting a democratic regime. Singapore’s Channel News Asia indicated that international observers are interested in the event, but many of them could not make it in time on March 24th. Channel News Asia’s analysts also said voters fall broadly into 3 categories; those who support the current government, the group that does not support the current administration, and those who have not yet made up their minds. The European Union has also shown interest in the political scene in Thailand, having their diplomats follow up on the latest updates. Most﻿ of these media outlets have emphasized﻿ the fact that this is the first election since the 2014 coup﻿. Channel News Asia’s analysts also said voters fall broadly into 3 categories; those who support the current government, the group that does not support the current administration, and those who have not yet made up their minds. This article reads like straight out of the communist propaganda book from the 1960’s - Oh and they conveniently forgot to mention that foreign news channels where blocked out the moment they started to report that there was widespread cheating going on. During my active time in the media we stuck to some simple rules. One was: if you are not familiar with a topic- DO RESEARCH - if you can't, don't insult the paper you write on! Aljazeera was watched at chez Fantom and the election reporting was excellent. ... The European ﻿Union has also shown interest in the political scene in Thailand, having their diplomats follow up on the latest updates﻿﻿﻿. Channel New﻿s﻿﻿﻿﻿ Asia’s analysts also said voters fall broadly into 3 categories; those who support the current government, the group that does no﻿﻿t support the current administration, and "those who have not yet made up their minds". The latter that is until they were convinced by the cash incentives at the ballot box!! Probably just an oversight that the Nation report on foreign media reaction omitted any reference to the universal view that the election was a sham because of the rigged military constitution, the clampdown on electioneering and of course Junta cheating. For what it's worth my own view is that the election was still worth having despite the abuses. The Junta party did much better than expected notwithstanding the unfair advantages it had.PTP did okay but still underperformed the optimists' hopes. The Thaksin brand not really as sparkling outside the N/N.E heartlands. The Democrats and Suthep were humiliated. Thanathorn made a very good start. Lots of evidence the old political shenanigans still going strong. Prayuth will be PM. My comment to him - be careful of what you wish for. Lots of scope for humiliation. I think anti-Junta folks have to be honest and not pretend the polling irregularities deprive Junta parties of a mandate. There are millions of Thais who just want a quiet life. It's the start of a long journey to real democracy, but I think it's a step forward. It will be a never ending journey if folks adopt the passive attitude that you seem to promote. Perhaps you believe the meek really will inherit the world. Polling irregularities are only the final insult to democracy. Let's not forget the banning of electioneering until mid December for all except the junta who were running around Thailand for months handing out money to all and sundry. Nor the Friday broadcasts by dear leader on all TV channels (although I would agree the likely affect of these would be to induce a deep sleep for many). Nor the junta appointed 250 senate seats meaning Phalang Pracharat only needed to win 126 lower house seats to get a majority whereas all other parties would need 376 out of the 500. Nor the banning of one of the anti junta parties. Of course if this gerrymandering doesn't work and a non junta government is formed then their hands are tied by the 20 year programme laid out by the junta and overseen by a junta appointed commission. Sadly the word democracy has no place in what is happening here. I don't disagree with you really. It's not so much that I believe the meek will inherit the earth, more an observation of passivity in many Thais who in the past would have been choking with rage at how their country has been governed. I can't fully explain why this has happened. I may have spoken too soon about Prayuth being PM although I still think it's much the most likely option. There's a chance Sudarat might be able to put a government together with a coalition including BJT and FF. You might reasonably ask what about the Senate/army objections. ( although remember 250 is a lot of people to control) Obviously, these could sink a PTP led government but I'm guessing that the "powers of darkness" would be reluctant to stir up the wotsit right now - ie in the world's gaze and just before a very important event. In the longer run of course, if the great plan looked like going off the tracks, we could expect parties to be dissolved and the usual bag of tricks to be deployed. I may have spoken too soon about Prayuth being PM although I still think it's much the most likely option. There's a chance Sudarat might be able to put a government together with a coalition including BJT and FF. You might reasonably ask what about the Senate/army objections.Obviously these could sink a PTP led government but I'm guessing that the "powers of darkness" would be reluctant to stir up the wotsit right now - ie in the world's gaze and just before a very important event.In the longer run of course if the great plan looked like going off the tracks, we could expect parties to be dissolved and the usual bag of tricks to be deployed. And I wouldn't disagree with you re Thai passivity. I find it amazing that many prior PTP voters would vote for the junta party when it represents the very people who forced out their previous government's. Perhaps showering them with money did the trick. It is good to see Future Forward doing well, I like their leader. He has said he doesn't see an alliance with anyone with the closeness of the election. He thinks its going to create instability with a possible further early election or even military intervention and is happy to sit in opposition. If he and others feel that way then I suppose Prayut it is! I don't think showering of money had anything to do with it - any more than it did with PTP's success in the past. The vote buying argument has long been discredited as a significant factor in Thai elections. That doesn't mean it doesn't happen. It's just that it's not that relevant to the results.